I have been using Visual Studio Code (VSC) in web development for a while and I love its speed, expandability and general design. Today I got an idea, which felt like a lightning strike (not literally, but figuratively). Could I use VSC in my big .NET projects? Lets find out! I'm currently working with a quite big Web API project. Solution contains multiple projects, Nuget packages, automated tests and so on. I use Postman to test app, so I don't need a Visual Studio to test app. I'm also using IIS to host app, so I don't need IIS Express to run app. Only thing I will lack in VSC is a debugger. That is of course a huge thing, but maybe I can use Visual Studio to debug app and VSC in main coding? Then I launch VSC and open project folder. Cool, it took only few seconds to load whole folder. Compared to Visual Studios 15 seconds that is fast. Then press Ctrl+Shift+B to build and vola! Oh, no vola. No task runner configured. Well lets configure one then. Comment TypeScript out because I'm not interested from that now... and uncomment msbuild. Ctrl+Shift+B again to build. Lots of build messages appears into console. and vola! Well almost. Time elapsed 17 seconds and 4 error(s). You can safely remove that part and your solution will build. Well lets get rid of that nuisance and try again. Note: Its easy to edit project files by just ctrl+clicking the path given in error message. Property group is found from main project. Let's remove it and try again. Cheers! I'm up and running. I make a little change into code, build, test with Postman and everything seems to work. This seems to go too well. Next let's try to make a little bit bigger change which includes call into another project. error BC30002: Type 'Customer' is not defined. Yes I need to add reference, but there is no way to add it. I have to do it manually or use Visual Studio to add it for me. I'm also lacking import/using statement for projects namespace and VSC don't know how to do that. That is also manual labor. 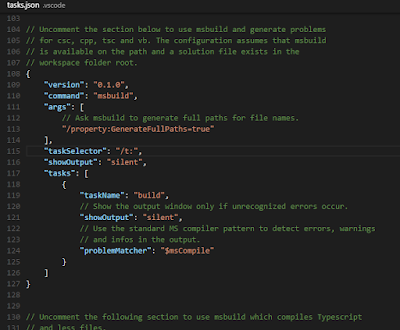 So what are the benefits and drawbacks of using VSC to edit WebAPI projects. VSC use about 200 MB of memory with this project. Visual Studio use 650 MB. VSC builds project in 17 seconds. Visual Studio build time depends on size of changes. Visual Studio can optimize build process much more than msbuild does so it's almost every time faster than VSC. Visual Studio supports ReSharper, but there is no confirmed timeline for VSC ReSharper plugin and VSC doesn't support nunit/mstest out of the box (those would be a very cool plugins btw.). VSC don't know how to add references or using/import statements, so for that Visual Studio is still needed. It seems that VSC is suitable for small code editing, but Visual Studio is still king of the hill in WebAPI/MVC projects. However VSC is good tool to edit project files, make small changes into code and to simply build whole solution quickly. As a website design company .Web India Market offer a full-circle approach in responsive website designing and web development services. Our website designing services covers Strategic Planning, Business Intelligence, Creative Application Development, Digital Marketing, SEO services and e-commerce solutions. Decent blog posts….. Keep it up. Great article, it will help me in future. I have read this article and it is really interesting for reading. You have mentioned all the related things with efficiency. Really appreciated. Now buffalo web development service is available from Crystal Tech Solution in a professional way. Spark Interact web design Agency Sydney with 12+ years experience in Web development & WordPress. You have discussed an interesting topic that every designer to know. Very well explained with examples. Spark interact is recruiting for 2018 check out the great new positions and apply online now Visit web design sydney and upload your resume.